I wrote last week about the urgent priority to encourage motorists to switch to electric cars. At present air pollution kills 72 borough residents a year – as well as diminishing the quality of life for the rest of us. A big switch to electric cars would be transformational. A significant incentive could be allowing electric cars to use bus lanes. So it is disappointing that Hammersmith and Fulham Council has rejected the idea. Now there can be a more general argument about whether bus lanes are an overall benefit in terms of traffic congestion and passenger journey times. In Liverpool most bus lanes have been abolished to ease traffic congestion for motorists. The length of time for bus journeys only increased fractionally and the number of bus passengers actually increased. At Holborn tube station passengers were asked to stand on both sides of the escalators – instead of walking on the left and standing on the right. This meant congestion was eased as capacity increased. One can see the same logic provides a case for getting rid of bus lanes. On the other hand perhaps Mr Stubbing is correct and that allowing electric cars to use bus lanes would increase overall journey times. I think he’s wrong – but let us suppose he is right. What is more serious? That a bus journey takes a minute or two longer or that air pollution continues to cause us to die an year earlier than we otherwise would and means we are wheezing and spluttering before it finally finishes us off? Crossrail 2 is a vital new railway, and will help London and the wider south east to continue to thrive economically. All of the stations on Crossrail 2 are designed as interchange stations, well except for one – the proposed station on the Kings Road. This station has received lots of objections from local residents. Lucy thinks “it would spoil the ‘village’ nature of Chelsea, but would bring much needed improved transport links to South Fulham” – actually Lucy is another Sands End resident. However I don’t think we should be concerned over the huge objections ongoing in Kensington and Chelsea about the station. Instead we should be highlighting the majority support for locating the station in the local area, plus the many benefits of the Imperial Wharf site, that cannot be realised by a non-interchange station. Currently TfL have only undertaken limited investigation into the impact of a station at Imperial Wharf. They estimate that 30% more residents would use an Imperial Wharf station in the morning than one on the Kings Road, with more than 6,000 people entering the station in the morning peak, including nearly 1000 fewer people using Fulham Broadway – this assumes no changes to local buses. It is reasonable to assume that were additional bus capacity available the station would be even more popular. In addition, they estimate that there would be 1,600 passenger interchanges between Crossrail 2 and London Overground in the morning peak– there would also be a related reduction in crowding at West Brompton and on the District Line. TfL have not considered the financial benefits in land costs, capital receipts from redevelopment or potential Section 106 developments, but they have acknowledged there is a significant potential in the local area. I think the construction of Crossrail 2 and the provision of an interchange station at Imperial Wharf is an excellent idea. 250,000 people a year in the UK suffer from shingles. It is a very unpleasant illness. Victims can die from it, although that is rare – about one in a thousand cases. But what is commonplace – approximately 100,000 cases a year – is to develop “postherpetic pain” when the virus damages a nerve. The pain is typically excruciating. 20 per cent of shingles patients remain in pain after three months. For those admitted to hospital the average stay is 14.6 days. More often the infection means the elderly can stay at home but are unable to look after themselves. The good news is that there is a shingles vaccine (called Zostavax) that is available. There is a phased introduction. It is currently available free on the NHS for those who were 70, 71, 72, 78 or 79 years old on the 1st September, 2015. If you are eligible – or you know someone who is – it is something to be contact your GP about. Apparently it costs the NHS around £55 a shot – which is rather high for a vaccine. But not only will it avoid a lot of misery, it is also good value for the taxpayer. The bad news is that the take up in Hammersmith and Fulham is less than half the national average. Between September 2014 and May 2015 it was 27.7% in Hammersmith and Fulham for the routine vaccination at age 70 years. The uptake for England was 52.8%. For 78-year-olds it was 25.5% against 53.8% nationally, 21.0% against 52.5% nationally. These figures are a disaster. The statistics represent a terrible human toll. There will be vastly more misery for the old people of our borough from this disease than for the country as a whole. This is avoidable. Remember the Council spends £22.7 million a year on Public Health – most of this spending is currently wasted. Also consider that this is a Council that spends £88 million a year on adult social care – including providing carers for those residents unable to look after themselves due to shingles. So the Council’s indifference is not only callous but financially inept. Other councils have been active on this – which may partly explain the higher vaccination rates. The Council should use Public Health funds to write to all qualifying residents to urge them to take the jab. They should back this up with visits. It should be made as easy as possible – for instance offering the vaccination on site in sheltered housing accommodation and indeed in residents’ private homes. What about also paying for the vaccine itself for borough residents aged 73-77? According to the last census the borough population is 183,000 with around 3% of us aged 70-79. So perhaps 5,000, and perhaps 2,000 aged 73-77. Of course not all of them will take the jab – it is a matter of personal choice after all. But supposing half of them did at a cost to the Council of £50 a time and thus a total bill of £50,000. I suspect that would be money rather better spent that most of current £22.7 million current Public Health budget – with teams of people writing reports for other people to file. I have written to Cllr Vivienne Lukey, the Cabinet Member for Health and Adult Social Care, asking for the policy to change. She has a wide remit and I actually think it is understandable if she was not aware of the current policy on shingles vaccination. But I do hope that having been made aware of the policy she will not seek to defend what seems to me to be indefensible. I am delighted – as a Sands End councilor – that there seems to be agreement between the parties to support and campaign for the siting of a Crossrail 2 station at Imperial Wharf in my ward. Furthermore, unlike the Kings Road site, there is overwhelming public support for the Imperial Wharf option as well. Sands End has had large scale developments in the recent past and is expected to undergo significant amounts of further regeneration in the future. Even with the successful delivery of the overground station at Imperial Wharf by the last Administration the transport infrastructure in Sands End is in desperate need of upgrading. The main transport spine of Sands End is the A217 – more commonly known as the Wandsworth Bridge Road. Figures from the Department of Transport show – that in the 12 months to September 2015 (the latest figures available) the speed of traffic on the Wandsworth Bridge Road suffered the greatest fall in speed of any road in West London – a fall of 35.8%. We don’t need a 20mph speed limit as the average speed is just…………..7mph. I am sure that I do not need to state that this crawling traffic contributes significantly to poor levels of air quality and health outcomes for my residents. The congestion on the Wandsworth Bridge Road will only get worse once the unwanted and unloved Thames Tideway Tunnel aka the Super Sewer, construction gets underway after Easter. A new station at Imperial Wharf would also relieve congestion on the Wimbledon branch of the District line – the most heavily congested section of the whole of the underground network. In engineering terms, changing the route of Crossrail 2 – to Imperial Wharf – we have been informed, will actually lead to faster journey times as the route would actually be straighter that if a station were sited on the Kings Road. Mike Brown, the TfL Commissioner, has stated that the proposal is ‘being seriously considered’. We – as a council – must ensure TfL is in absolutely no doubt that – along with residents – that this Council is fully supportive of the proposal for a Crossrail 2 station to come to Imperial Wharf. A former member of this council once stated that ‘a tide of concrete is sweeping through Sands End’. Whilst we welcome the opportunities that regeneration will bring, we need to ensure the proper infrastructure is in place to support the new jobs and the new residents that regeneration brings. A Crossrail 2 station at Imperial Wharf will vastly improve the quality of life of present and future Sands End residents. There surely can be few duties of a Local Authority more important than improving its residents’ quality of life. Joe Carlebach is a councillor for Avonmore and Brook Green Ward. Holocaust Memorial Day, which falls today, serves for me as it does for many as a point in time when we can reflect on the catastrophe which befell European Jewry at the hands of the Nazis. It has a particular poignancy for me, since I lost my grandparents, three teenage aunts and other family members in the Holocaust. My father escaped just in time on the kindertransport less than a year before war broke out. As part of my personal journey, I have been revisiting the life and times of my grandfather [pictured, right], who was a scientist, a community leader and an outspoken critic of the Nazis and all they stood for – which ultimately cost him his life. 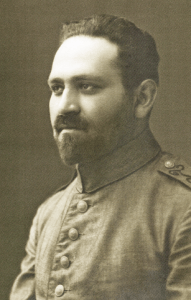 I was surprised to learn that, at the outbreak of the First World War, he volunteered for the German Army, initially enlisting as a telegraph operator and then serving as a Jewish chaplain for the German army on the eastern front, which leaves two points that I have struggled to comprehend – first, that he served in the German Army at all and, second, that had fate posted him to the western front, he might well have faced other close members of my family in battle. They fought for the British Army, most notably Colonel Sir Phillip Carlebach of the London Fusiliers. Examining the wider subject of German Jewish soldiers serving the Kaiser, I was again taken aback when I learned that approximately 100,000 Jewish Germans served in uniform. Approximately 12,000 died in action in the First World War. It seems that German Jews felt it their duty to fight for ‘their’ country, just as Jews in Britain, France and the US did for their respective nations. This was of course no different from the followers of other religions in Germany at the time. Early signs of institutionalised anti-semitism became evident in the German Army’s attitude to its Jewish ranks. In October 1916 a report was commissioned (Judenzählung or the Jewish Census) looking into the dreadful aspersion that Jews failed to serve on the front line and were generally a negative influence on their brothers in arms. The results of the report were ‘doctored’ to support this theory, deliberately ignoring the truth and thus sowing the seeds for a future tragedy. After the First World War, the Jewish community mourned its sons who had laid down their lives for the “Fatherland” – even as the very nation they had fought for turned on them. In 1935, Goebbels issued an order that the names of fallen Jewish soldiers should be struck off (literally chiseled off) war memorials across Germany, a bitter blow for the families of the 12,000 fallen Jewish soldiers. As late as 1937, my grandfather led a service of remembrance for the war dead at the Ohlsdorf Jewish Cemetery in his role as Chief Rabbi of Hamburg. A member of the Gestapo was present listening carefully and making notes of everything he said in his address – as they did on every occasion my grandfather spoke in public, even from the pulpit of his synagogue. There is a dark irony that on Kristallnacht, when many synagogues were looted and destroyed, plaques commemorating and honoring the communities war dead lay amongst the ruined buildings. As the Second World War got under way and the Nazi deportations to the Ghettos and extermination camps began, even hardened Nazis were shocked to see Jewish fellow Germans wearing their war decorations on their way to their deaths. These included some of Germany’s highest military decorations for bravery. Some Jewish German veterans did manage to escape to Britain and the US to serve as members of the Allied armed forces. This gave rise to utterly bizarre and ultimately heart-breaking scenes such as one reported in the Royal British Legion Journal describing a wreath-laying service at the Cenotaph in Manchester. A group of German Jews all serving in the British Army, in uniform, had participated in a wreath laying service and I quote) ‘practically every man was wearing German war decorations’. The tragic conclusion to this aspect of the Nazi genocide is the desolate presence of Jewish soldiers’ graves in and amongst the First World War German cemeteries. There is no-one left to mourn them or to place a stone on their grave (the traditional Jewish custom on visiting a Jewish grave). These soldiers gave their lives for their country. Their country rewarded them by taking the lives of their wives and children, their mothers, sisters, fathers and brothers. Such was the cruelty and sheer heartlessness of the Nazis. It is very difficult for me, as someone who has always regarded himself as a patriotic “Brit” and keen supporter of our veterans, to comprehend this part of my family’s history and the wider tragic ramifications. However, on a day when we remember the victims of the Holocaust perhaps we should spare a thought for these ordinary brave men in uniform. They fought and died for a country that ultimately turned on them and sought to strike their sacrifice from history. But in thinking of them we can deny the Nazis and their attempt to rewrite the past – and show that in Britain we continue to be a beacon of tolerance and understanding in a still troubled world. This post originally appeared on Conservative Home. Last November the Labour-run Hammersmith and Fulham Council retreated from a proposal to scrap weekly bin collections. The proposal was abandoned after a campaign led by Cllr Charlie Dewhirst mobilised strong opposition from local residents. Well we all make mistakes. The difficulty remains that Labour didn’t have the honesty to admit. They sought to claim the Council consultation was nothing to do with them. Instead of having the courage of apologise they dived for cover and blamed the bureaucrats – who had simply acted professionally in carrying out he orders of their political masters. Cllr Harcourt authorised the consultation. For a long time they refused to answer. There followed a series of email exchanges who I won’t bother you with but which fans of Yes Minister might find amusing. Cowan: What did he know and when did he know it? So the implausible suggestion that council staff did the whole thing without political authority is proven to be false. If there was never any possibility of scrapping the weekly bin collections then why consult on the proposal. Also is it really plausible that Cllr Harcourt kept the council leader Cllr Stephen Cowan and the rest of the Cabinet out of the loop? It is hardly a trivial proposal. Either Cllr Cowan knew what was happening and authorised. Or as council leader he really has no idea what policies the council is consulting on. Neither explanation inspires confidence. Lord Soley, the former Labour MP for Hammersmith, has spoken out over his Party being taken over by the backers of foreign dictatorships. A Labour grandee has launched an attack on Jeremy Corbyn’s closest adviser, claiming that Seumas Milne is a Marxist sympathiser who has long been an opponent of democracies. Lord Soley, who has known the party’s director of strategy and communications since the 1980s, accused him of being soft on authoritarian regimes. Mr Milne’s support for Vladimir Putin has become a liability for Labour since a High Court judge on Thursday found that the Russian president “probably approved” the assassination of the former spy Alexander Litvinenko with radioactive poison in a London hotel. Lord Soley warned Mr Corbyn that he had surrounded himself with advisers, including Ken Livingstone and John McDonnell, who had been favourable to hardline regimes. He claimed that the Labour leader was too reliant on a narrow group of old associates in the capital, which would damage the party’s image in the wider country. Mr Milne chaired the constituency Labour party in Hammersmith, west London, when Lord Soley, then Clive Soley, was the local MP. The peer said: “Talking to him, and especially when he gave me a copy of his book about capitalism being a sort of card game, I knew very early that he was, if not a Marxist, then some variety thereof. “He was always overly sympathetic to authoritarian regimes and under sympathetic to countries that enjoyed democracy and the rule of law. He would be very critical of Britain or the United States but not very critical of Russia or Iran, countries or regimes I would keep my distance from unless I was trying to change them. I find it odd that there is this group around Jeremy of him, Ken Livingstone and John McDonnell. They are all people who have identified themselves with quite hard regimes.